Rosemary Laing’s photographs of place may appear at first glance to be empty. In the contemplation of them, however, it becomes clear that although they are not full of the figures of people, they are replete­ with the echoes of passage and inhabitation. Indeed, it is possible to say her work is characterised by its depiction of excess, an excess of the elemental in physical and metaphysical forms. In Laing’s photography, we can never pretend we are simply looking through a frame at a conventional landscape in panoramic view. It is crucial to understand that, as an audience, we are standing beside the artist in the making of these images and in our consideration of whose land we are standing on. Several important motifs recur in Laing’s work of the past 30 years. These include the history of the Australian continent; its colonial and contemporary culture, to which she belongs; the dynamics between order and chaos; and the elements of fire, water, earth and air. Laing’s 1988 series Natural Disaster­s depicts the elements in excess, resulting in firestorms, drought, flood and cyclonic activ­ity. Fire and the colour red run through several pictures, ­including How We Lost Poor Flossie (Fires) from Natural Disasters and her new series, Buddens (2017). It’s there in the blood-coloured lighting over the decommissioned Woomera detention centre, emphas­ising razor wire and bars in 5.10am, 15th December 2004 (2004); and in the old red clothes like a sinuous artery or river of flesh in the Buddens series. 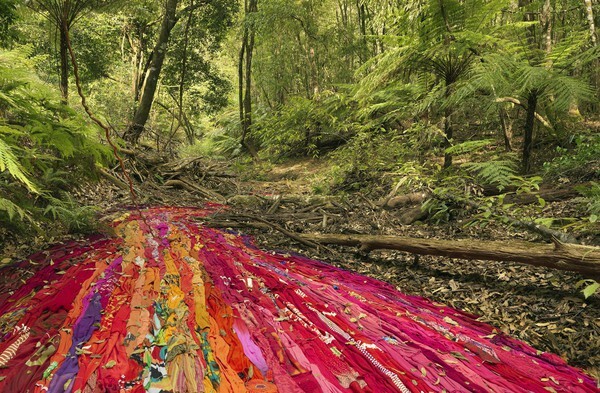 The river of used clothes might look a little like Laing’s earlier series­, Groundspeed (2001), where she used Feltex Axminster carpets such as Red Piazza, which were familiar from postwar suburban Australian homes, to overlay the ground. However, Buddens has a different focus and two parts, both shot in the verdant inland area of the NSW south coast, home to the Buda­wang and Yuin people. Here a river rushes into Wreck Bay, the site of as many disasters as rescues during the past 200 years. One part of this new series has the slightly enlarged wooden skele­ton of a roof truss half buried in a hillock adjacent to the river. 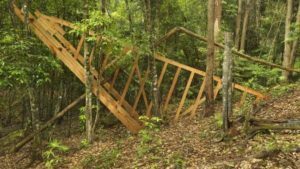 The romantic notion of sanctuary in nature is penetrated by a made structure that can shelter no one, given that it is unclad and the orientation not practical. The other part of this new serie­s replaces the river flow with the used, red-toned clothes. Hundreds of discarded garments, once worn by people, mimic the water that has bubbled up inland and gathered its force, depositing jumbles­ of debris on its banks when in flood. The purposeful nature­ of the water, and the old clothes, becomes a metaphor for massed movement, the details of its passing and what is left behind. Art historian Tanya Peterson has researched the words and image­s of earlier Australian artists and explorers, and how Laing revisit­s these in her panoramic photographs, holding up a mirror to our beliefs and their fragility. The environment is never empty, it is always peopled by ghosts, if not the living. The horizon line where earth meets sky is, Peterson notes, like “a type of flatline that runs the lengths of the photographs”. The long view is a motif Laing regularly employs in her work, while tripping us visually with objects in the foreground. 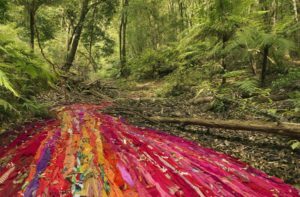 Laing’s play with the photographic plane is the obverse of the decorative and appears often in her work where the density and weathered nature of the bush, especial­ly in the areas of NSW she is most familiar with, has resulted in images of great poignancy. These include Effort and Rush #9 (Swan Fires) (2013-15), Weather (Eden) #2 (2006), The Paper, Thursday (2013), and the vertiginous Still-life with Teapot and Daisies (2017) from the Buddens series. The last particularly references the relationship between place and time, through title and construction. Observing the intim­ate detail of the bush and its ever-changing aspects becomes analogous to the flux in states of mind. The pale tonalities of the earlier works are not reflected in Buddens; rather, the haunting is of another order entirely. Here it is the ghostly murmurings of the vast numbers of indiv­iduals trying to find sanctuary. We are drawn into this environment and its confusion. It is hard to know how big or small anything is: the lush canopy closes out what is above and beyond. Trees and ferns could be massive or not at all; likewise the structure that might once have been a home, or could be again if circumstance allowed. The detail, the vortex of the rich interior view, the echo of those passing through, and our own perception of these things all contribute to an imaginative ­construction of space, a “what if?”, and a propulsion into action. Laing’s choice of location for Buddens is deeply felt. The famil­iar­ity is important as she considers her own relationship to place and the overlays of culture. Her choice of titles ranges from the names of locally shipwrecked vessels Rose of Australia and Walter Hood, to shipwreck stories and rescues by Aboriginal people (Wildflower), and still-life paintings by Grace Cossington Smith and Margaret Preston (Drapery and Wattle, Still-life with Teapot and Daisies). How to make sense of what huma­nity does in and to the envir­onment, regardless of whether that environment appears to be natural or made? What is the spectrum­, the temperature of that activity? Laing is an artist who grapples with these questions and how to reflect and interpret the times in which she lives. In Buddens, as viewers, we stand in the middle of a flood gazing, unable or unwilling to provide shelter. We are also, if we think about it, looking at ourselves streaming past, blindly and contrarily upstream, towards what we hope will be surviva­l and refuge, somewhere.